There are approximately 700,000 young carers in the UK. That is about 1 in every 12 school aged children, who are caring for a family member. The Barnardo’s Service in Wirral, supported 152 young carers aged 5 -18 between April 2016 – March 2017. Out of these 152 young carers, 71 were caring for adults with a diagnosed mental health illness, 32 were caring for adults with a physical illness or disability, 34 were caring for adults who have a neurological condition such as MS, brain tumor, stroke or dementia, 9 were caring for an adult with a terminal illness and 6 were caring for an adult with drug or alcohol problems. The term young carer should be taken to include children and young people under 18 who provide regular or ongoing care and emotional support to a family member who is physically or mentally ill, disabled or misuses substances. A young carer becomes vulnerable when the level of care-giving and responsibility to the person in need of care becomes excessive or inappropriate for that child, risking impacting on his or her emotional or physical well-being or educational achievement and life chances. Barnardo’s Action With Young Carers is commissioned to ensure that young carers and young adult carers up to the age of 18 are identified and can receive a carers assessment under the statutory duty of Wirral Council. Action With Young Carers work within a whole family approach to reduce the negative impact of caring by accessing support for the young carer and family members where there is an identified need. 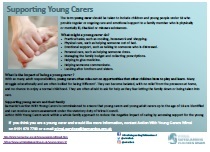 What can the Young Carers service offer ? Getting help, advice and support for the person you care for.